I put in a new coil and in the directions that came with it, it stated polarity was important and if you have positive ground you should connect the negative terminal to the ignition wire and the positive to the distributor. Then I realized the one I had taken off was opposite of this with positive terminal to ignition and negative to distributor. After looking at the wiring diagram the coil was originally correct but the diagram does not specify positive or negative on the battery, only that one wire off of the battery is black and the other is to ground. I ran the tractor a while with the coil the other way and now I am worried I may have messed it up. Which way is correct and did I possibly damage the coil if I have it backwards? The long and short hash marks that represent the battery indicate a negative ground. Having run with the coil reversed won't do any damage. If you reverse the battery, polarize the generator before starting the engine. Failure to do this could cause damage. Normally, a 12 volt system is negative grounded. However, if you have a generator and regulator, the system will work with a positive ground. You didn't mess up the coil. Depending on how the coil's internal, secondary winding/wire is grounded, it may not work quite as well if correctly grounded. Jim Becker wrote: The long and short hash marks that represent the battery indicate a negative ground. Having run with the coil reversed won't do any damage. If you reverse the battery, polarize the generator before starting the engine. Failure to do this could cause damage. Eugene wrote: Normally, a 12 volt system is negative grounded. However, if you have a generator and regulator, the system will work with a positive ground. I have had her almost 2 years and she was hooked up that way when I got it. With the coil being correct for negative ground before and the wiring diagram from the GSS-1411 76 revised service manual seems to match my tractor exactly. The ground wire to the battery is red and the wire to the tractor is black, looks like someone just put the battery in wrong. Glad to hear it hasn't hurt anything. Would that explain why it wasn't charging the battery though? I will get her straight eventually. LilCub wrote: Would that explain why it wasn't charging the battery though? Probably not. If the generator and regulator were working, and regulator was incorrectly polarized, they would deplete the battery is very short order. Jim Becker wrote: If you reverse the battery, polarize the generator before starting the engine. Failure to do this could cause damage. If whoever switched the battery to start with didn't polarize the generator what would if have hurt, the regulator or the generator? Eugene wrote: If the generator and regulator were working, and regulator was incorrectly polarized, they would deplete the battery is very short order. Battery stays dead always, have to jump it off or hand crank everytime I get her out. And excess current would have probably ruined some contact points in the regulator. The 12 volt system is negative ground, like they said, beginning in 1964, at Cub serial number 224401. 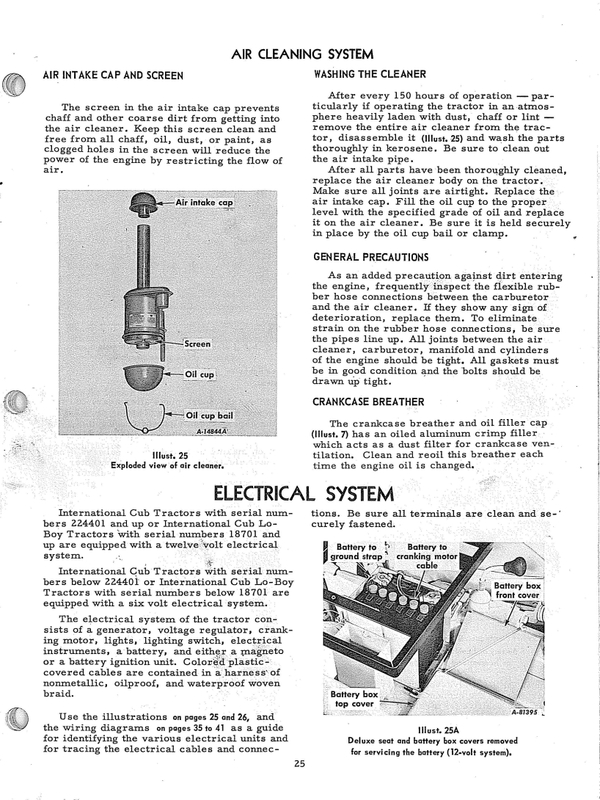 Here are pics from the 1975 Cub owner's manual showing how the battery originally looked. 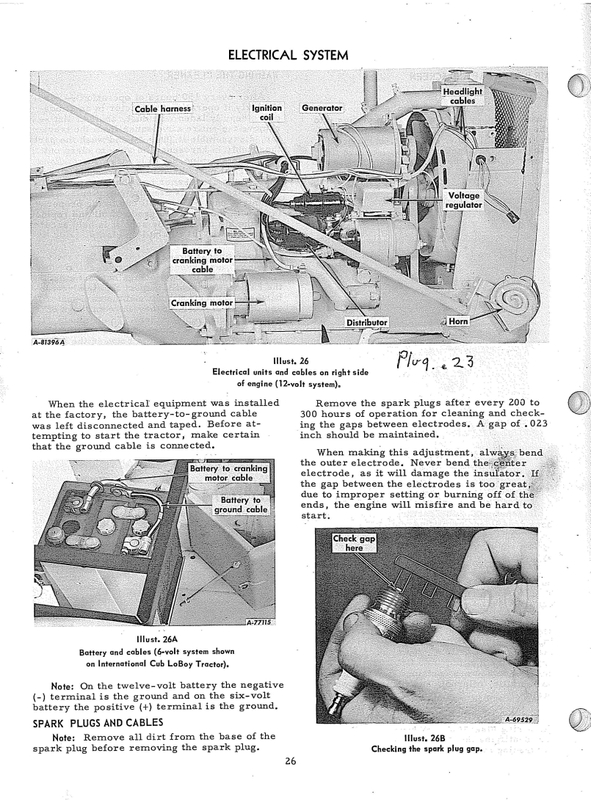 There is info about the negative ground on the 2nd page, below the pic of the 6 volt battery. The manual is made for many years of Cubs, showing 6 and 12 volt info. If your Cub is a 1973, use the 12 volt info. It is a good practice to never solely rely on the color of the wire to determine whether positive or negative ground. Verify with the + or - physically marked on the battery case near the post and where the wire attached to each goes. Also the positive post is a little larger than the negative post on most batteries. If you can't see the marks on the case then you probably need to clean the crud off the battery. Scrivet wrote: It is a good practice to never solely rely on the color of the wire to determine whether positive or negative ground. Great advice. Many 6 volt tractors were converted to 12 volt. The owner didn't change the battery cables to match the current color for positive or negative. I remind my son that all but one of my tractors was originally 6 volt. I utilized my old cables, because they worked. And I'm cheap.